The bad news is that a WAD only has room for 3 waterfall objects: WATERFALL1, WATERFALL2 and WATERFALL3. These slots have in common that the texture they use is scrolling, giving a waterfall effect. The good news is that you can have more 'waterfalls' in your wad! Those waterfalls will need to use the textures of those in the WATERFALL slots but they can be different in shape. 1/ Copy a waterfall object into a waterfall slot, using WADMerger. Now you have an object which uses a scrolling texture animation: the water. 2/ Once you have filled the waterfall slots you can put other (waterfall) objects in animating or static slots. 3/ Make sure that the static or animating slots waterfalls use the same watertexture(s) as the waterfalls in the waterfall slots. So you may need to retexture the static and animation slots waterfalls using STRPix, replacing their original textures with the waterfall ones. The scrolling texture should be the first texture in the wad's textureset. Because the texture is already scrolling because it was originally used for a 'real' waterfall it will also scroll on the static and animating slot objects. So there's your new 'waterfall'! 4/ These new waterfalls won't automatically have sfx assigned to them, by typing in a certain OCB value, so open your project and place sounds near the objects to give them sfx. IMPORTANT: You do need to keep the original waterfall object in the waterfall slot(s). If you take it out the texture will stop scrolling on the static and animating slot objects!!!!! NOTE: This trick works with all objects, including puzzle items and puzzleholes. It might even work on Lara's outfit but I haven't tried that. a - The first screenshot shows the object in the WATERFALL1 slot. 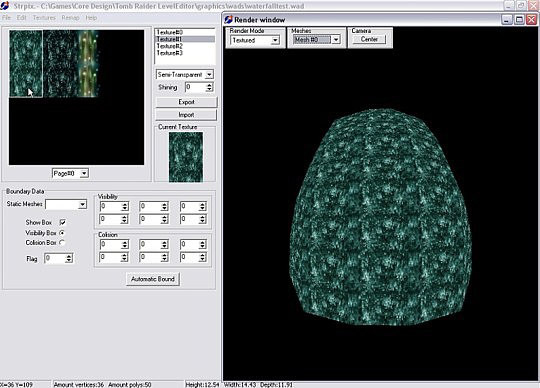 It uses the first texture in the wad's textureset. The WATERFALL2 object uses the second texture and WATERFALL3 is a custom made object which uses the third texture. b - Let's say you want to have another object to have that same scrolling texture: a sort of electrical lightrays that serve as a lamp/heater. Copy an object into your wad and put it, for example, in the PLANT1 slot. c - Open Strpix again and select your PLANT1 object. 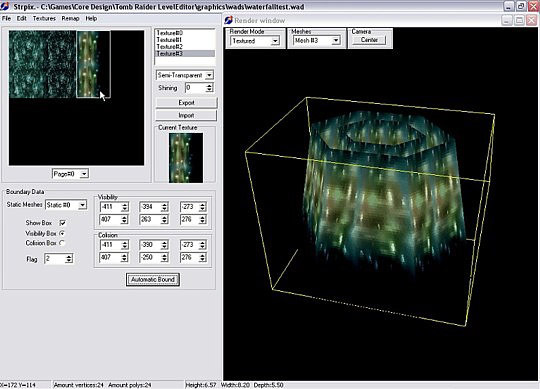 Now select the third texture and texture the object with it. Save the wad, place the object in your project and check out the lamp with moving lightrays! 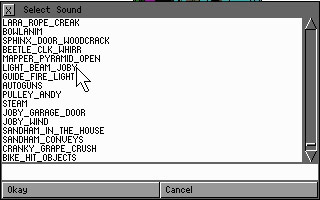 (Please note that this method can cause texture scrolling on other objects in overloaded WADs. So if your level is already pushing limits, be wary of adding more waterfalls).